A little over thirteen years ago, my first child was born. 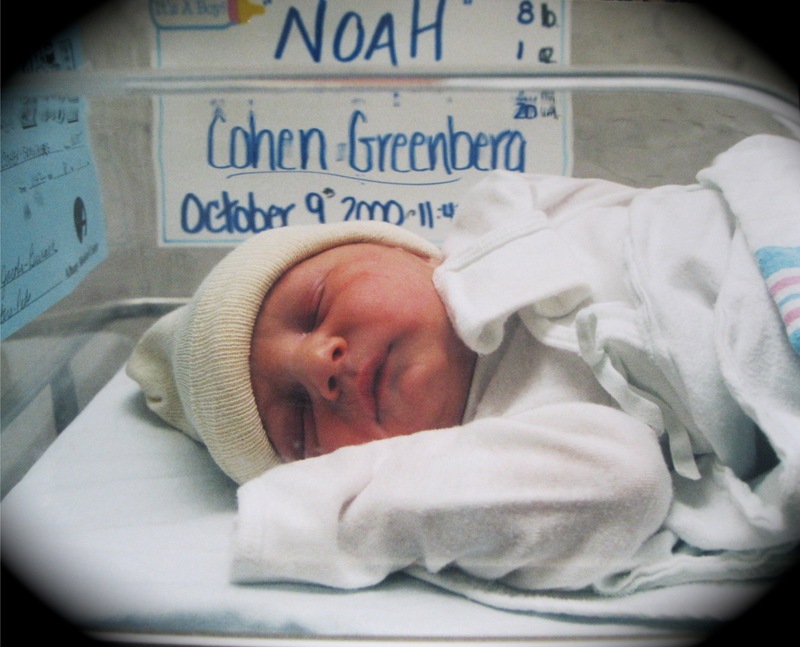 We named him Noah Cohen-Greenberg, which maybe could have sounded more Jewish if we’d tried harder (middle name “Moses”? ), but maybe not. Shortly thereafter, he was circumcised in the hospital by a sardonic Korean obstetrician. If you are Jewish, you may have already read the subtext of that sentence: Noah wasn’t circumcised in a bris, a religious ceremony characterized by assembled witnesses wincing, a defenseless newborn wailing, and bagels. My husband and I were Jewish by upbringing and heritage. We were also nonbelievers who had never exactly said “no” to religion. Although we had more or less cut God out of our Jewish wedding, we hadn’t been brave enough to cut the “Jewish” out. But from the safety of Albany Medical Center, after a quick conversation with Dr. Lee, we circumvented the ritual circumcision. No bris, no matter the repercussions. To wit: Adam’s father, a self-described “traditional Jew,” was furious, and refused to touch Noah for the first eight days of his life. I think that’s because the bris is supposed occur on the eighth day, but, in any case, it was horrible. I should still resent him for that. But I can’t. My father-in-law’s childlike dependence on rules is heart-breaking. Also heart-breaking: his self-defeating attempts to control his grown children’s religious life; and his inability to discuss his beliefs using reason, reflection, or a socially acceptable decibel level. So I felt sorry for him. And I could tell—after those eight days elapsed—how much he loved his new grandson. More to the point: I’m a get-along kind of girl, especially with male authority figures. It’s embarrassing to admit, but it’s true. So we got along. Went to holidays up at the in-laws’, bearing challahs or Passover desserts—contributing food where we could not contribute religious feeling. We side-stepped questions about Jewish education for the kids. On High Holidays, we didn’t go to synagogue, but we didn’t flaunt it: in fact, we hid the fact that we were working when we “should” have been praying; and we told our children not to mention their Yom Kippur play dates when Grandpa inquired about their day. Steadily approaching all that time was the magic number: thirteen. Would Noah want to have a bar mitzvah when he came of age? Despite the fact that we’d been raising our children as atheists, it wasn’t out of the question. Although Noah is not a believer, he is a belonger. When Grandpa suggested Noah take Hebrew lessons up at their house—a kindly Jewish educator did the tutoring—Noah said, “sure,” and even made sure to wear a yarmulke. When aunts and uncles and family friends asked about his expected upcoming bar mitzvah, he played along. I started to worry. I had been bat mitzvah myself. And I have good memories of the whole process. The effort of studying, practicing, and writing, of being a gracious host and a worthy center of attention, makes for an excellent rite of passage, as well as rich fodder for future stand-up routines and therapy sessions. If Noah wanted all that, could we really refuse? I didn’t know. But I knew I had to get him to tell me the truth—his truth—which is not easy with an adolescent who aims to please. I asked him in private if he really wanted to have a bar mitzvah ceremony (“I guess so”) and why. He answered “because I’m Jewish.” Doubtless the unspoken impetus behind all kinds of rituals, but does it constitute sincere desire? Noah, I said. You know that your dad and I don’t believe in any of this other than the bagels. And you know that having a bar mitzvah would be a lot of work. We would consider doing it. But first I need you to write a paragraph explaining why you want to. Just a paragraph. To see if he was serious. To understand his thinking. To show him I would expect effort from him, that his desire would be animating this adventure, not mine. Rather than wait for him to opt out, I gave him the chance to opt in. Noah never opted in. In fact, after a spate of bar mitzvah parties last spring, he seemed to lose interest, leaving the whole question behind him as he ran happily into his first season on the cross country team. “I guess so” became “I guess not.” His thirteenth birthday passed. My father-in-law made no comment. So when I took Noah to his grandparents’ the other night for a Hebrew lesson—recently restarted after a long hiatus—I didn’t think anything of it. A bit of Hebrew can’t hurt his brain; well-educated people should be familiar with the Old Testament; an hour a week doesn’t seem too much to please an old man. This was my reasoning in the face of my husband’s this-can’t-end-well head shaking. He means it. Noah is sweet to his core and attached to his Grandpa in a way that his brother and sister are not. Noah also hates conflict, craves approval, and wants to fit in. Does he really want to have a bar mitzvah ceremony? Does he want to study Torah? Would he ever choose to go to synagogue? Does he intend to participate in a Jewish community? No, no, no, and no. But the idea of aiming that “no” at Grandpa—risking his disappointment, his disapproval, and possibly his disfavor—is unthinkable to him. Fair enough. Saying “no” to authority figures, saying no to other people’s expectations on behalf of your own true beliefs and desires: that’s a dividing line between childhood and adulthood that I still find difficult to cross. I’m forty-three. How could I expect him to cross it at age thirteen? I had said “no” just once, right after Noah was born, when I first felt both the terrible responsibility of parenthood and—on the threshold of teaching a brand new person all I knew about the world—a new clarity about my beliefs. Noah is thirteen now, but he’s still my baby. I asked him if he wanted me to tell Grandpa that there would be no bar mitzvah. And he said yes, if I promised not to say the decision was coming from him. I can do that. I can try to protect him from the repercussions. And maybe if Noah sees me do it, my get-along boy will learn to say “no” for himself one of these days. That’s a rite of passage I will be proud to witness.